Method: Retrospective analysis of laparoscopic antireflux surgery performed under one consultant in an Upper GI tertiary referral centre. Referral pattern, learning curve, specialist training and late outcomes were analysed for all anti-reflux surgery from January 1996 to December 2007. 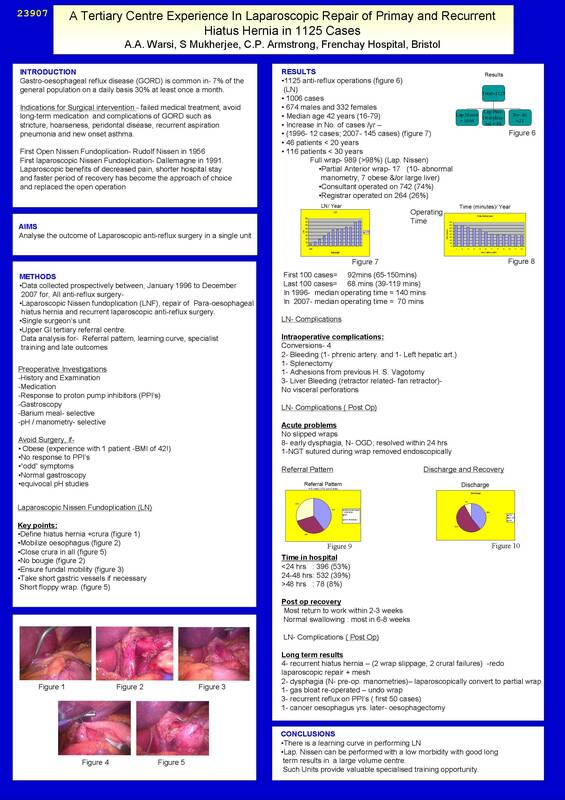 Data were analysed for Laparoscopic Nissen fundoplication (LNF), repair of Para-oesophageal hiatus hernia and recurrent laparoscopic anti-reflux surgery. Results: During the study period, a total of 1125 procedures were performed for 1115 patients- 1006 LNF, 98 laparoscopic para-oesophageal hiatal hernia (LPH) repairs and 21 laparoscopic redo hiatal hernia (RDH) repairs where the initial operation was performed in another centre. In 1996 only 12 LNF were performed whereas in 2007, 145 LNF were performed, representing a 12-fold increase. The median operating time in 1996 and 2007 were 145 mins and 70 mins respectively. There were 156 patients with Barrett’s oesophagus, 52 had strictures due to gastro-oesophageal reflux disease (GORD) requiring dilation. Majority of the referrals were from the gastro-enterologists and general practioners (GP). Respiratory physicians and ear, nose and throat (ENT) referrals accounted for 60 cases, 49 of these had asthma, with symptoms refractory to conventional medical treatment. All the asthma patients’ symptoms improved and remarkably 41(83%) patients were off all medications. The consultant performed 746 LNF whereas trainees (senior residents) performed 264 cases under supervision. There were 4 conversions to open in LNF due to bleeding, splenectomy and dense adhesions, and 4 in LPH because they were very large hernias. 4 (RDH) were completed laparoscopically. Eight patients (0.7%) developed post-operative dysphagia but were treated conservatively. Good number of patients (39%) went home within 24 hours and 53% within 48 hours. 99% of the patients followed up in the outpatients were happy with the surgical results. The learning curve seems to plateau after nearly 5 years of antireflux operations or after 200 cases. The average time taken to return to normal daily activities was 2 weeks. Conclusion: Laparoscopic antireflux surgery is safe, effective and durable in the treatment of GORD. Tertiary referral centre offers invaluable training opportunities for senior surgical trainees.